Released 2015. The cd comes as a free bonus album with a purchase of either My Finest Hour or Journeys at gigs or online orders. 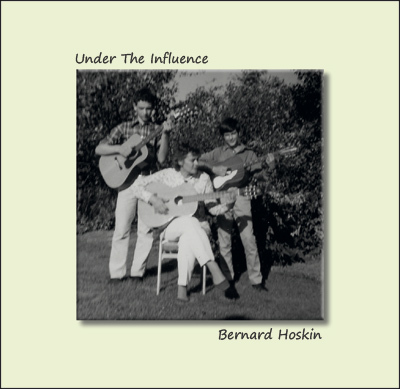 Under The Influence is my tribute to the songwriters and guitarists who most influenced me during the classic singer/songwriter period of the late 1960s to the mid 1970s. 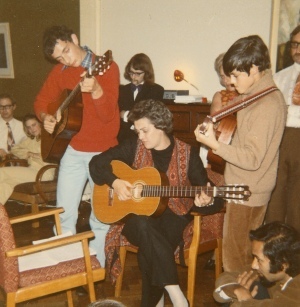 The photo on the right is of my first ever live performance playing Plane Crash At Los Gatos with my older brother Jon and our mother. The album cover photo is us in the back garden of our house in Cambridge. It is one of the ironies of life that the significance of events only becomes apparent with the passing of time. In 1963 at the age of five as the Beatles burst onto the scene I had no idea that the greatest pop music ever would be created over the next few years. Nor that it would never be this good again! It was my good fortune to have a brother Jon, not that much older than me, but somehow with the good taste to spend his pocket money on Beatles EPs and then to play them to me. So it was that the pop music of the 1960s was to provide the soundtrack to our early years but it was folk music that was to provide the real inspiration to my own songwriting. By the late 60s I was spending my own pocket money on such singles as Those Were The Days by Mary Hopkin, The Night They Drove Old Dixie Down by Joan Baez and Ruby Don't Take Your Love To Town by Kenny Rogers. All story songs with something to say. My mother was a big fan of Joan Baez and Julie Felix and sang some of their songs accompanying herself on a Spanish guitar. I remember lying on my parent’s bed strumming the open strings of this guitar, loving the sound and longing for the day when my hands would be strong enough to play the chords. When I was eleven my brother Jon and I both took up playing Mum’s guitar and had a rota for its use until we were able to get our own instruments as birthday presents. I loved my mother’s Joan Baez records and was especially attracted to the poetic imagery in her covers of Bob Dylan songs although I was too young to make much sense of it. Don’t Think Twice was one of the first that I learnt to play. My first public appearance was with my mother at a party in Cambridge when she sang Julie Felix’s version of Woody Guthrie’s Plane Crash At Los Gatos. Jon and I played along on our guitars. In 1971 I was gven a Christmas present of Simon & Garfunkel’s Greatest Hits. The quality of the songwriting and the performance was a revelation to me. Paul Simon became my favourite singer/songwriter and remains so to this day. The Boxer is from this album and Duncan is from Paul Simon’s 1971 solo album. 1973 was the year of a life changing experience. Jon decided that we should go to the Cambridge Folk Festival and we paid £2.25 each for our full weekend tickets. Steeleye Span were headliners and I later became a big fan but at that time it was the singer/songwriters and guitarists who grabbed my attention. I loved the idea of one person alone on stage with just an acoustic guitar and their own stories and songs to hold the attention of an audience. The American Steve Goodman is still the finest solo act that I have ever seen and City Of New Orleans is his best known song. I will never forget the sound of 8,000 people singing the chorus. On the Saturday Jim Croce made a surprise appearance the very week that he was number one in the USA with Bad Bad Leroy Brown. Sadly it was to be his only UK gig as he was killed in a plane crash just seven weeks later. I started playing his songs then and still do. Time In A Bottle and Operator are two of his most successful songs and great favourites of mine. The third act that made a major impact on me was the British singer/songwriter Havey Andrews who at that time was in a duo with guitarist Graham Cooper. The following year Jon decided that we should we should make our debut as performers at a folk club. Along with his friend Dave Prentis on bass we called ourselves The Down So Long It Looks Like Up To Me Band after the Harvey Andrews song. Our one and only appearance was at The Anchor pub in Cambridge at a folk night run by local group Spriguns of Tolgus. We played Harvey’s song plus John Prine’s Dear Abby. Jon was lead singer and lead guitarist while I concentrated very hard on playing all the right chords! Over the next couple of years the Cambridge Folk Festival introduced me to three of the biggest influences on my songwriter and guitar playing. I have learnt more from Bert Jansch than anyone else apart from Paul Simon. Poor Mouth is one of his own songs but he was also an inspirational arranger of traditional folk songs. Jansch’s fellow Pentangle guitarist John Renbourn is someone I made a serious study of. I learnt his arrangement of Willy O’Winsbury in the mid-1970s and still enjoy it today. Many years later I discovered that the song had actually been created by another of my musical heroes Andy Irvine who put the traditional lyrics to the traditional tune so successfully that everyone assumed the song had always existed in this form! Ralph McTell of course found fame with Streets of London but there is so much more to him than this. He is one of the finest British singer/songwriters and an excellent guitarist. I remember his performance of Naomi on the main stage at Cambridge very well. By the late 1970s I was listening to a lot of Celtic music from groups such as Clannad and The Chieftains, I had added Gordon Giltrap to my list of guitarists to study and was enjoying American singer/songwriters such as Joni Mitchell, James Taylor and Jackson Browne whose song For A Dancer closes this album. Of course, there are many other songwriters and musicians I owe a lot to but these have been the most significant. I have had the pleasure of meeting some of them over the years. I opened for Bert Jansch at the Cambridge Folk Club, and for John Renbourn and Jacqui McShee in Bedford. I booked Harvey Andrews for my own gig, Acoustic Routes, and awarded myself the honour of being the support act. I bumped into Ralph McTell at Cromer’s Folk On The Pier festival once and had just enough time to tell him that he had been a major influence on me as both a songwriter and guitarist. Bert Jansch, John Renbourn, Steve Goodman and Jim Croce are all gone now but I hope their music will live on for many years. In creating these recordings I have tried to remain faithfull to the spirit of the original versions while adding something of my own to each one. I hope you enjoy it.